The final countdown. Following my brief escapades with 'Cowboys & Aliens' on Day 1 and the queue confusion/funny films on Day 2, Day 3 saw me run across London after a half-day at work to catch 'Conan The Barbarian' and the secret screening - which I rather surprisingly managed to get into. To find out what the secret film was, and for a summary of the weekend, do read on. There's pictures and everything. I'd planned ahead for my final day at the Empire Big Screen so ran over to see 'Conan The Barbarian' (3D). I wish I hadn't bothered really. Despite being told that the screening I was attempting to get into had been cancelled(! ), I soon found myself being bored to death within Cineworld Screen 3. I'm not sure whether the Ahnuld original was any good but I can assure you that the remake itself is as unneccessary as its use of 3D. As with all the films I saw over the weekend, longer form reviews will be published eventually. To cap off my Empire Big Screen 2011, I figured I'd try to get into the secret screening. Especially as I'd heard that it was probably going to be 'Tinker, Tailor, Soldier, Spy' or 'The Woman In Black'. After a brief wait and a considered moan at someone who told us that we wouldn't be able to get into the screening (another day, another lie), a few of us press types were allowed in. The secret screening was of 'The Debt', a remake of an Israeli film surrounding the cover up of a botched (fictional) Mossad mission. It proved to be a little disappointing, despite a reasonable cast including Tom Wilkinson, Helen Mirren and Jessica Chastain. A competent but underwhelming thriller. Thus, my first movie convention was ended on a fairly middling note - perhaps symptomatic of the weekend itself. But I still enjoyed myself and many thanks to all the people who were involved in the Empire Big Screen - especially Romley Davies for giving us the opportunity to review the event. The organisation wasn't the smoothest but everyone was obviously doing their best. I certainly hope the event will be back next year, with a more easily understandable queue system and perhaps more repeat screenings of films and panels. Maybe next year I'll even fully immerse myself in the nerdom of panels, quizzes, costumes and the like. 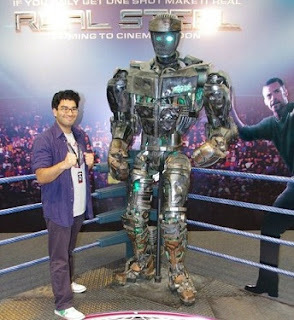 Here's a bonus photo of me with one of the robot props from 'Real Steel', I know it's what you've all been waiting for. For all our coverage of the Empire Big Screen, click here. For more info on the event, head to empirebigscreen.com.